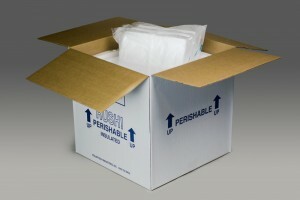 When shipping perishable items long distances, dry ice can offer many benefits. When you need to ship perishable items, dry ice may be the best option to ensure that your materials get where they need to go in the right condition. While not every situation calls for dry ice, many will benefit from its use. Many individuals and companies utilize dry ice in shipping because it offers a variety of benefits that we want to share with you today. Should I Use Dry Ice? If the material you are shipping cannot be frozen, dry ice may not be for you. However, in almost every other instance, it’s an excellent solution for perishables. Dry ice lasts longer and stays colder than frozen gel or water packs and will ensure that your perishables arrive in the same frozen condition they are sent in. Along with staying colder longer, dry ice offers the benefit of not being wet. Not only does this make for a cleaner and easier shipping process, but it also prevents the creation of secondary waste which must be disposed of. Dry ice is also cost-effective and made from recycled CO2, so it has a net zero impact on the environment. One of the concerns that many have about dry ice is that they will have to take additional precautions when shipping. While it is true that you will need to use and alert the recipients of the use of dry ice and how to handle with care, in general, it is entirely safe. You will just need to ensure that you are following correct postage guides for the material. This entry was posted on Friday, March 8th, 2019	at 1:28 PM	and is filed under Shipping Seafood, Shipping with Dry Ice	. You can follow any responses to this entry through the RSS 2.0	feed. Both comments and pings are currently closed.